The squat, L-shaped building is nothing special to look at. Inside is a two-storey library that is open to the public at all times of the day and night. No staff appear to work here. At midnight each night, all the books and scrolls in the library magically return to their proper places (including any items that have been removed). A section of the shelving on the basement floor can be pulled away to reveal a secret (and locked) entrance to the home of the architect and owner of the library, Joddok Kerrien. Two floors of high shelving stuffed with books, scrolls, and folios, on topics ranging from the mundane to the esoteric. A secret door behind the bookcases on the basement level of the library leads to 3. This room serves as Joddok’s private library, holding volumes that would never be shelved in the main room. Here you will find tomes on demonology and other powerful magics. The western side of this room is Joddok’s storage area, holding crates and chests filled with books and items that she has yet to sort and catalogue. Joddok’s needs are few. The north wall holds a long bookcase near Joddok’s desk, a fireplace surrounded by a large rug and Joddok’s one armchair, and a pair of mannequins/dummies on which Joddok stores a number of interesting items (a tiara, a number of necklaces, a chain shirt, and a cloak, all with unusual properties). The east wall holds another set of bookcases. A small kitchen area is by the door to 5. This is Joddok’s food stores. A small well in this room provides her with fresh water. This is where Joddok sleeps, and stores her day-to-day clothing. Joddok’s workshop is caged off from her main living area with thick iron bars. Inside is her workbench, filled with potion vials, spell components, a number of books, chalks, powders, incense, and the like. A raised platform on the west side of the room holds a summoning circle. The caged area to the south of the workshop is where Joddok holds particularly interesting – and dangerous – creatures that she intends to experiment on. Long time readers of Loot The Room might remember this post from February last year. I posted a small set of hexagonal geomorphs that I’d begun working on, and promised more soon. Well, soon didn’t happen as soon as I would have liked, but I finally got there. I’m happy to announce that I’ve just released my first set of hexagonal geomorphs on DriveThruRPG. 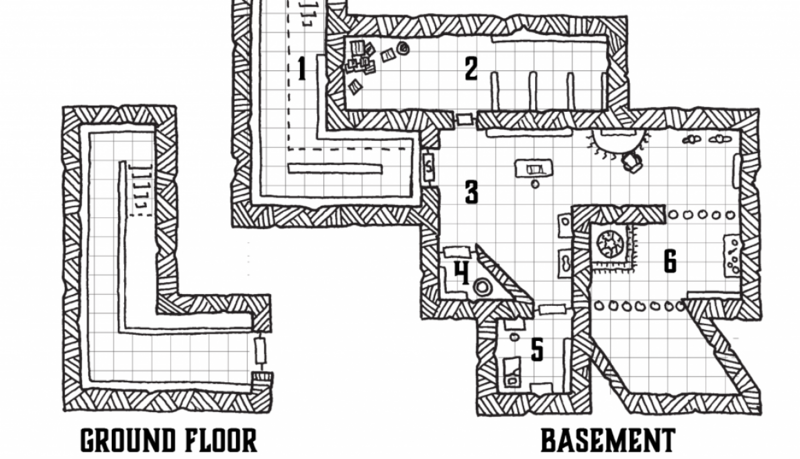 They’re available for $4.95, and you can use them to create tons of dungeons like the map I’m giving you today. The first set of Geomorphs contains 6 hexagonal geomorph tiles, plus an Entrance tile and a Final Chamber tile. All of them are printable with a 1 inch grid, as well as being provided in gridded and gridless forms for VTT use. Oh, and you get a blank hex template so you can draw your own ‘morphs that work with mine. 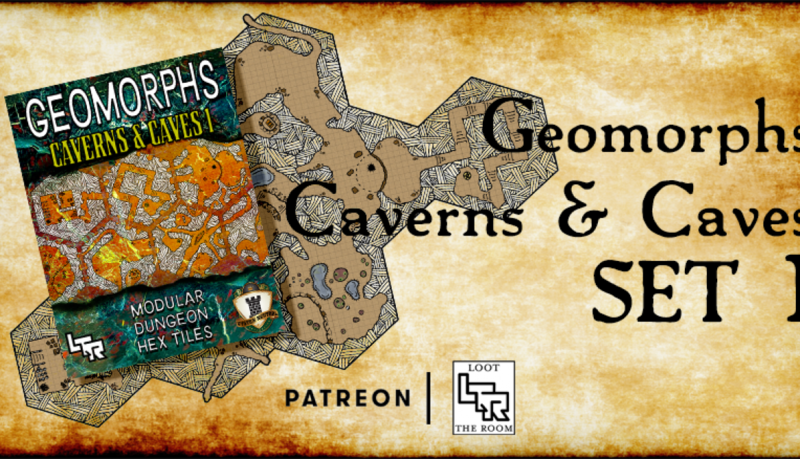 Grab Geomorphs: Caverns & Caves 1 from DTRPG here. I’d love to hear what you think of these, so let me know in the comments! Lub Fardreamer was a goblin mystic who was practically worshipped by her tribe, practically worshipped for her prodigious (for a goblin, at least) psionic abilities. She and her tribe constucted this labyrinth beneath their caves and used it to store their most valuable treasures. Lub knew that goblinkind often meet sharp, painful ends at the hands of bigger, smarter humanoid races, and she wanted to ensure that she would have somewhere to escape to that would confound the invaders who would almost inevitably come for her and the tribe. Goblins, of course, are not renowned for their intelligence, even when they are famed mystics. Lub’s Labyrinth, for all its size, is trivially easy to solve, and when the adventurers came Lub found that her defences were simply not enough. The labyrinth has fallen into disrepair (not that it was ever very well maintained to begin with), and the roof and walls have begun to collapse in some sections. Where rubble is marked on the map, it rises to within a foot of the already-low 5′ ceiling. The statues that dot the corridors are effigies of Lub herself, and the central chamber holds a rusted iron chest that contains the treasures of the tribe. Tomorrow I’ll be putting up a bonus post with a couple of random tables to help you populate this dungeon. In the mean time, assume that its corridors are full of tricksy goblin traps, and maybe the odd skeletal adventurer who has fallen prey to the place. Happy new year! It’s January 1st, and that means Loot The Room’s new schedule is kicking into gear. Welcome to the relaunch, and 2018’s first post. Back in November I posted some books and their contents. One of those books was A Bestiary of The Blasted Lands. I liked the names of some of those monsters enough that I wanted to stat them up – but first, I wanted to know more about the place they inhabited. Welcome to the Blasted Lands. The Blasted Lands are a lightly-detailed sandbox area designed to be dropped into your tabletop roleplaying game of choice. Although it is designed with 5th edition in mind, there is no crunch here (although a future post will detail some of the monsters of the Blasted Lands, with appropriate stats). The Blasted Lands is known to the outside world through stories and myths, and the (probably exaggerated) tales of those few adventurers who have ventured into the lands and returned to tell the tale. Most people know only a few solid facts about the place: that it is bordered by an enormous steel wall, and that the lands beyond that wall are tainted by the weird touch of the fey. The Blasted Lands were once a dense, primeval forest. Some six centuries ago a great war was fought within the woodlands there – a war between the elves who made that forest their home, and an invading fey army. The war raged for decades, and the great magics summoned during the fighting tore a rift between the Prime Material Plane and the Feywild. The blast of arcane force that this produced scorched the land, transforming it from verdant forest to a harsh, blasted wasteland filled with weird, fey-twisted creatures and strange geography. The wall was constructed half a millennium ago, a great expanse of steel a hundred feet high that runs along the outer edge of the Blasted Lands. The wall has not been particularly well maintained; it is coated in a patina of rust, and has begun to be reclaimed by nature. There are no gates or passages through the wall, and despite the neglect it has suffered there are not yet any known openings in it. But it is a wall, and no matter how tall it is, it can always be bypassed by a taller ladder. Once over the wall there is a short transition from grassy scrubland that butts up against the base of the wall to the Blasted Lands proper, which is a barren desert of rock and not much else. Tall, jagged mountains ring the land to the west, giving way to flat plateaus of onyx that loom over the rocky desert – the Onyx Steppes. Strange, twisted plants that resemble shimmering crystalline structures dot the desert itself, along with the occasional grove of skeletal trees that have been transformed into obsidian sculptures. The area is usually still and silent, and time seems to stand still. Day and night do not occur naturally in the Blasted Lands; it is always noon, the sun always directly overhead. Night falls in small localised patches, seemingly at random; the sun vanishes from the sky like a torch being extinguished, and the temperature plummets to far below the freezing point of water in a matter of seconds. These patches of night can be seen from outside, appearing as dark blotches on the horizon. The map is presented as a hex map, comprised of 1 mile hexes. Since there is no overall campaign or adventure arc presented here, you should feel free to use the map and locations as you see fit. The keyed locations described below are the most immediately obvious (or well-known) to those traversing the Blasted Lands, but there is undoubtedly plenty more to be found out in the wilderness. Just beyond the Onyx Steppes lie the Amethyst Hills, an expanse of rolling foothills that have somehow been transformed into huge clusters of amethyst. Their glittering purple glow acts as a beacon on the horizon for travellers crossing the wastelands to the north. These hills, and the jagged peaks of the mountains to the west (which are also formed of huge outcroppings of amethyst) are the source of the River of Dust. As the land dips down from the foothills of the Amethyst Hills, it forms itself into a miles-wide valley where the ‘waters’ of the River of Dust feed into this wide lake, before continuing on to the Everbright Gorge and the Shadowfall. The dusklake is just shy of half a mile deep at its centre. Its waters are dark and murky, comprised of the same shadow waters as the River of Dust. The surface is covered in a thick layer of ash that coats the skin of anybody foolish enough to venture into the water. The River of Dust and the Dusklake do not contain water. Instead, their substance is composed of shadows that have been given physical form. They flow like water but have the texture of very fine sand – a texture which is experienced in the brain but that seems to bypass the skin entirely. Nobody is sure of the exact origin of the shadow water, but the consensus is that there can be no shadow without the existence of something to cast the shadow. Some believe the waters are the shadow of an ancient elder god, and that the waters provide a means of communicating with this entity. Being in contact with the waters results in negative side effects that grow worse over time. The table that follows gives the effects of being in the shadow water. Whether these effects are reversible is left to the GM’s discretion. 1 minute Your skin takes on a grey pallor, and all food tastes like ash. 2 minutes You become sensitive to sunlight, though your ability to see in the dark is heightened. 3 minutes You heal less effectively than normal, recovering only half your normal amount of health when resting. 4 minutes You become resistant to the effects of magical healing. 5 minutes Your physical form begins to unravel, as your body begins to transform itself into shadow. Carving a jagged line across the wasteland, the Everbright Gorge is a mile-wide canyon some 800 feet deep. It is so named because night never falls at any point in the gorge; indeed, no shadows are cast in the gorge at all. It is believed that they are drawn towards the darkness of the shadowfall and somehow consumed by it. The lantern dunes are an expanse of deep, shifting sands that cover the northeast of the Blasted Lands. Some explorers have reported sighting lanterns drifting unaided among the dunes. They seemed to be somewhat intelligent, reacting to the presence of travellers and attempting to lure them off-course into the sand. It is not known whether these are a natural phenomenon or some kind of fey creature (or, as some suspect, a form of will o wisp). Whatever they are, the dunes are named after them. The lantern dunes are also home to the dangerous entities known as Living Dunes, enormous predators that live among the sands and hunt anything with a pulse and meat on its bones. Remnants of the magical blasts that broke the land, the Onyx Steppes are huge ledges of solid stone jutting up out of the foothills of the mountains to the west of them. At their highest the cliffs are around 300 feet tall. The steppes are the nesting grounds of vulgores, the strange horned birds that drift over the desert in search of carrion. Stretching from the Amethyst Hills to the Everbright Gorge by way of the Dusklake, the River of Dust is a waterway of liquid shadow. Nothing lives in it, and nothing grows along its banks. Those who spend time near the river begin to hear whispered voices emanating from its depths, chattering nonsense in a multitude of languages. At the eastern end of the river of dust is the Shadowfall, an 800 foot tall ‘waterfall’ that crashes into the Everbright Gorge. The shadowfall is the only portion of darkness inside the gorge. Where it meets the ground of the gorge, a small pool of shadow slowly dissipates into nothingness as it is extinguished by the eternal brightness of the gorge. The following are some examples of the kinds of encounters adventurers might come across in the Blasted Lands. This is by no means an exhaustive list; the Blasted Lands are a weird place imbued with fey magic, and there are all sorts of strange and dangerous things to be discovered here. Deep in the central wastelands, where magic is at its most frayed, some adventurers have reported witnessing the sand forming itself into crude copies of them and their groups and attacking with brutal ferocity. These creatures – if they are creatures – have become known as doppelsanders. A broken road stretches out into the dunes for miles, straight as an arrow and lined with tattered banners that flap in an unseen breeze. Then, as suddenly as it started, the road vanishes beneath the sand again. The flowering oasis is the first waypoint for anybody hoping to cross the Blasted Lands – a pool of pure, clear water ringed by lush vegetation that (usually) follows a normal day-night cycle. It’s the perfect place to rest up and prepare for the next leg of your journey. First, though, you have to convince the cactus-folk who control the area to let you in, and their price is always high. Crossing the Onyx Steppes is fraught with danger – not least because of the pools of shadowsand that dot the area. Indistinguishable from the black onyx ground, these patches of shadow water have drowned many an unwary adventurer. Download this post as a PDF. Special thanks to JP Bradley, Alex Clippinger, Matt Sanders, and all my patrons. Compass rose by Deven Rue. I’ve been sick this weekend and am only just now recovering enough to be able to work again. So this map is a little late. Apologies about that. This is a simple slaver den carved into a large cave. A concealed area in the lower left portion of the map houses a cage where the slavers keep the people they have captured until they can sell them. In the upper left is the leader’s bedchamber; the rest of the slavers sleep around the small cookpot/fire in the right of the map. In the middle is a rough pit ten feet deep. The slavers like to entertain themselves when there’s no work to be done, and a cage full of people and a big pit to put them in fills that need. I’ve been posting maps on a Monday for a year or so now, so the ‘1’ at the end of the title doesn’t make a huge amount of sense. Allow me to explain. If you want to get involved, simply post a map of your own creation to Twitter on a Monday, and use the hashtag #mapmonday. There are no prompts or restrictions or anything like that – dungeon maps, town maps, ships, cities, continents, galaxies, map whatever the hell you want. I’ll be following the hashtag and retweeting things, and I’ve started a Twitter list of the people taking part, too. So, welcome to the inaugural #mapmonday. Here’s my map. A while ago I posted a short survey on Twitter (which you can still take, if you’d like to) asking about a new set of PDFs I was planning to release revolving entirely around taverns. I’ve been quietly working on them for a while now, and should have the first one out in the next couple of months. For now, though, I’m sick of sitting on it all and I wanted to share some of it, so I’m giving you one of the maps. The short of it is that I’m taking the tavern signs produced by the incredibly talented Deven Rue and doing full writeups of them as locations that you can drop into your games. This is the map for The Golden Lute, which I have no shame in admitting was inspired heavily by The Eolian from Pat Rothfuss’ The Name of the Wind. It’s a place where musicians, bards, and poets go to perform and to be seen to perform. Pack it full of weird stories and adventure hooks and you’re good to go. Thanks again to Deven Rue for allowing me to use her tavern signs for this project. I highly encourage you to go and check out her Patreon if you haven’t already. I’ve been a patron for a while, and she’s always posting incredible work, and making a lot of stuff available to other creators for use in their products. I recently came across this twitter bot, metropologeny, that uses algorithms to generate city/town/hamlet maps. (It’s by the same guy that wrote this bot, Uncharted Atlas, that generates random fantasy world/region maps. Anyway, it creates some really interesting layouts with excellent and inspiring use of negative space. I decided to fill one in, so now you get to see it. Here’s the original image the bot posted. Why do you think that building is hanging off the side of the cliff? Thanks again to Whipstache for helping me out this week. I’ve really enjoyed seeing his stuff, and I hope you have as well. I really like this map, and I’m pretty sure that I’m going to do something similar for Monday’s map. I don’t often draw non-dungeon maps, so this will be a nice change of pace. This coming Wednesday is the last Wednesday of the month – September has absolutely flown by, for me at least – and that means it’s Best of DMs Guild time again! I’m not going to be really tacky and include my own adventure in the roundup, so I thought I’d take this opportunity to remind you that Breaker of Chains is out now. Since I posted so much about the process of putting it together and releasing it, it only seems right to do a post-mortem of the release at some point too. I think I’ll give it another week or so until the adventure has been out for a full month, and then we can talk about what went well and what I think I’ll do differently next time. Thanks for all your patience while I took a week off to focus on other stuff. It’s very much appreciated – and, of course, thanks to Whipstache for stepping up and providing us with some content. Don’t forget to check out his site and follow him on Twitter, where he’s running a giveaway through the 25th (and not the 24th, as I said in the last post). This weekend I decided to start a collaborative dungeon project with my patrons (very much influenced by Elven Tower’s recent project). I can’t tell you any more about it at this point because I don’t really know much more about it, frankly. It’s still very early days, after all. Still, I’ll give you the map that we’re going to be using. This was generated using the random dungeon generation tools in the DMG (with some decisions about room size made when I started running out of space on the page and couldn’t fit in, say, a 60′ diameter octagon). I have absolutely no story to go with it, and you’ll just have to be OK with that. If you end up using this for something I’d love to hear what you decided it was, and I’m excited to see what my patrons come up with. I’ll keep you updated. So we’re almost ready to release the adventure we’ve been writing over the past couple of weeks, but first we need to revisit the map. We’ve added some new rooms, and we’ve defined what’s going to be in them. I had planned to talk about layout as well with today’s post, but I’ve spent all weekend finishing off Breaker of Chains (and I still need to make the rest of the pregenerated characters for it), so I haven’t had a chance to write all that stuff up yet. I’ll leave today’s post as a traditional map only post, and we’ll hit layout on Wednesday. 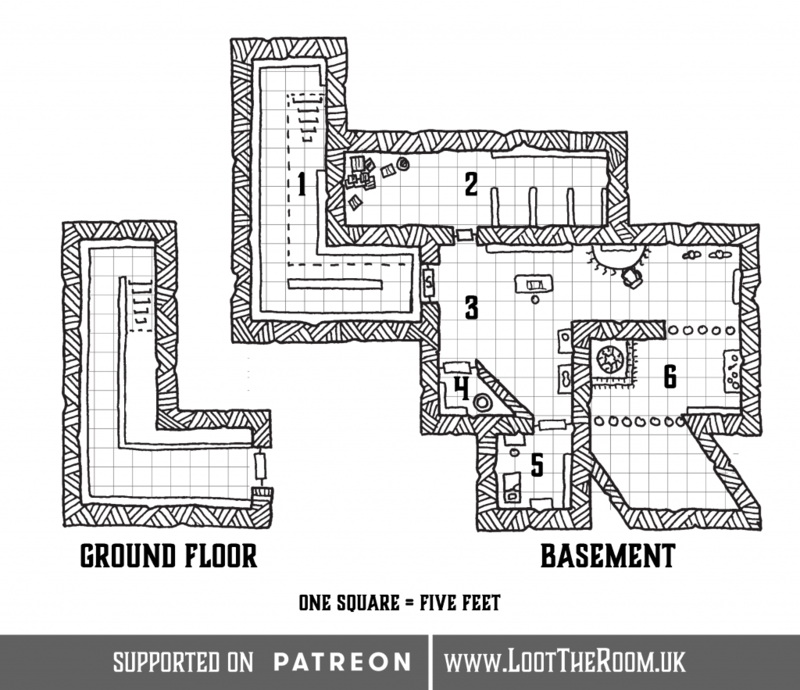 Patrons at the $5+ tier can get the coloured version of this map, plus a player only version. They’ll be included in Breaker of Chains when it releases on Thursday night.